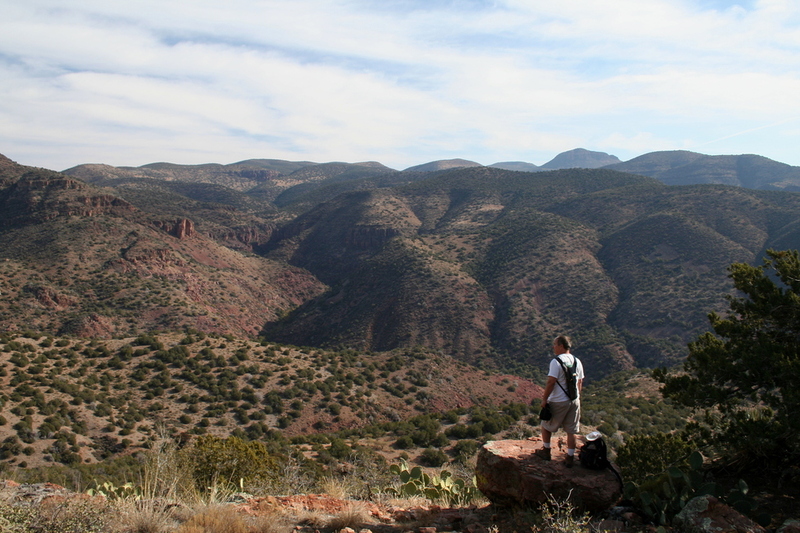 The Sierra Ancha (Spanish for "Wide Mountain") is an archeologically rich wilderness area known for some remarkable cliff dwellings made famous by Dr. Emil W. Haury and the Gila Pueblo Project starting in 1930. 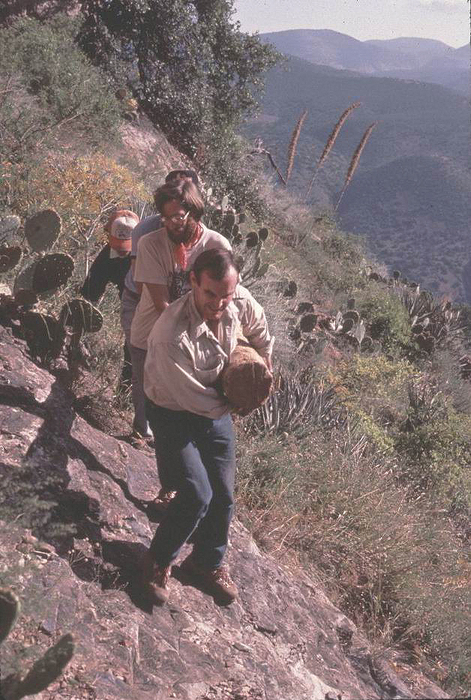 Dr. Richard C. Lange has continued that legacy with the Sierra Ancha Project starting in 1981 and continuing to present day. "From the Peterson Ranch, we went north to McFadden Horse Mountain, and several other parts of the crest of the Sierra Ancha. 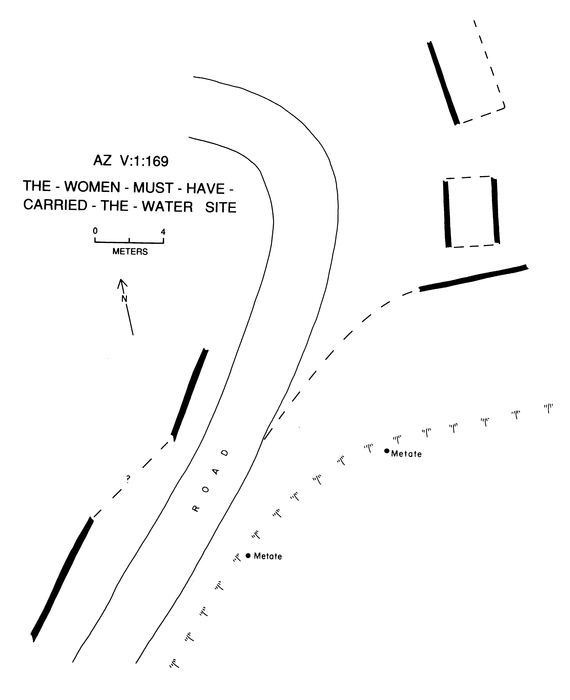 Then we dropped off the east side of the range, north of Pueblo Canyon and into Cherry Creek where we established camp. 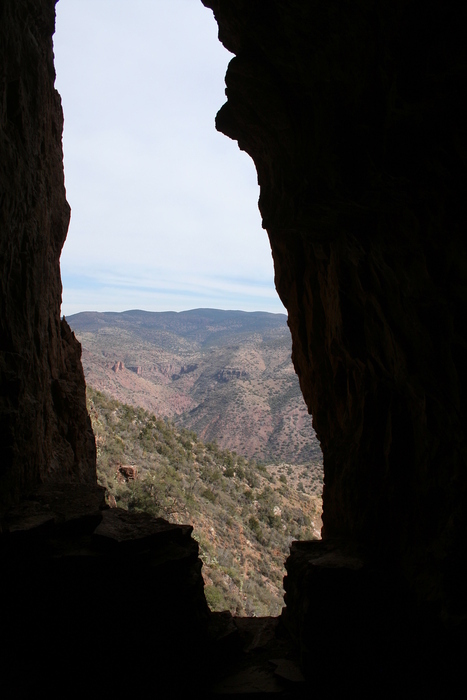 From our camp in Cherry Creek, we went back up into Pueblo Canyon, into Cold Spring Canyon, and into Devil's Chasm. After collecting wood in ruins in each of those canyons, we set out to the east, passing south of Sombrero Butte, and on into lower Canyon Creek. 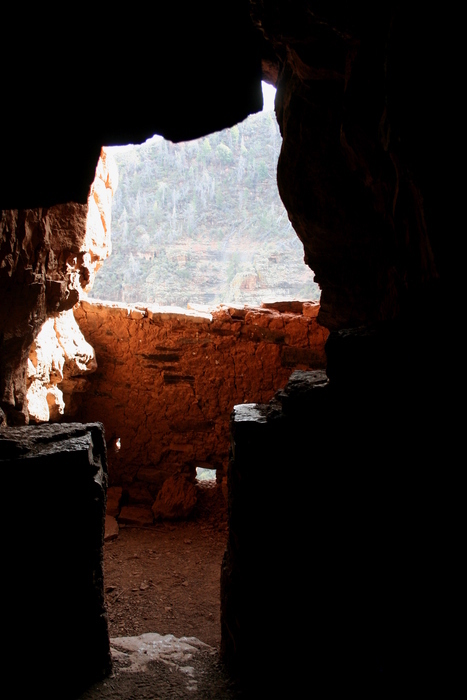 After inspecting a prehistoric turquoise mine, we went up Canyon Creek to the Canyon Creek Ruin, which Dewey knew about, but had not seen. We returned cross-country, almost due west, and dropped back into Cherry Creek to the Ellison Ranch, where we ended the adventure". 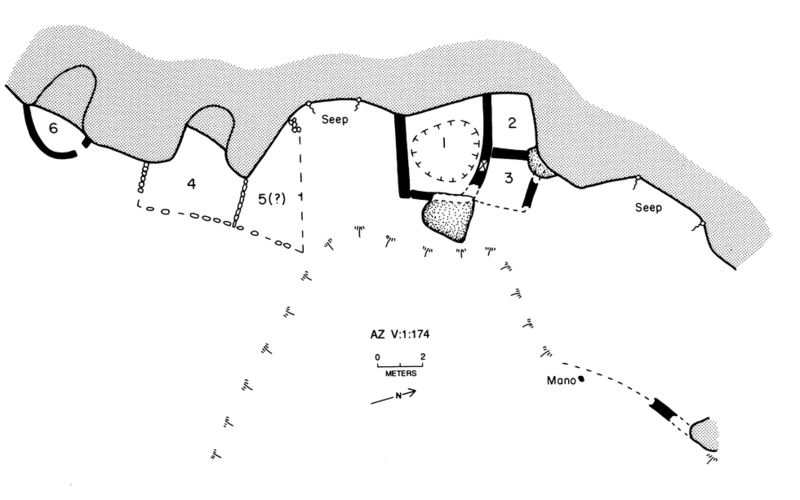 After several similar expeditions into the Sierra Ancha, Haury published his findings in 1934 as Gila Pueblo Medallion Paper #14. His seminal publication, "The Canyon Creek Ruin and Cliff Dwellings of the Sierra Ancha" was published later in the same year. 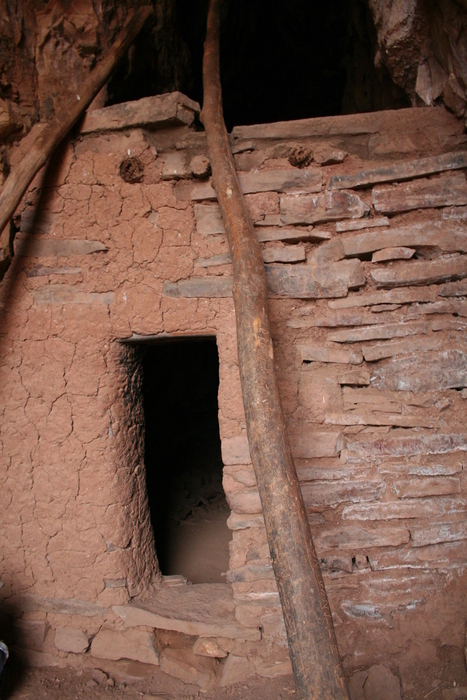 You can connect to the past by viewing the remains of the Peterson Ranch near Aztec Peak. The Ellison Ranch is still a going concern within Cherry Creek valley. Many of my favorite Cherry Creek hiking destinations are documented in Dr. Rich Lange's recent publication; "Echoes in the Canyons - the Archaeology of the Southeastern Sierra Ancha" celebrating the 25th anniversary of the Sierra Ancha Project (SAP). 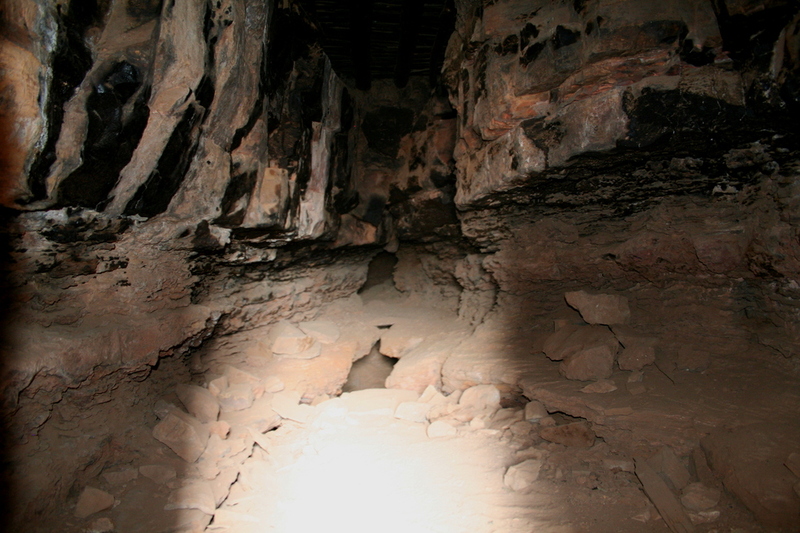 The SAP began in June of 1981 from a small grant by the University of Arizona Research Office to verify and update site information originally catalogued by Gila Pueblo. It soon became clear that the original scope of the project was larger than anticipated as many new sites were discovered and the project was stitched together piecemeal over the first 25 years of operation. 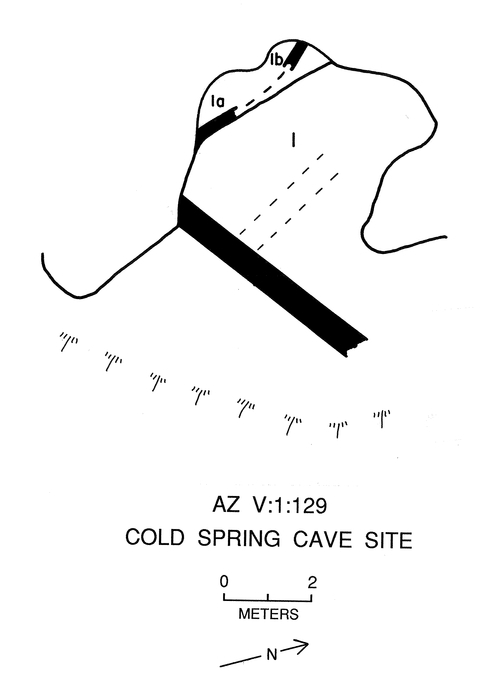 One of the first major undertakings of the SAP was a main beam replacement in Cold Spring Canyon site V:1:136. 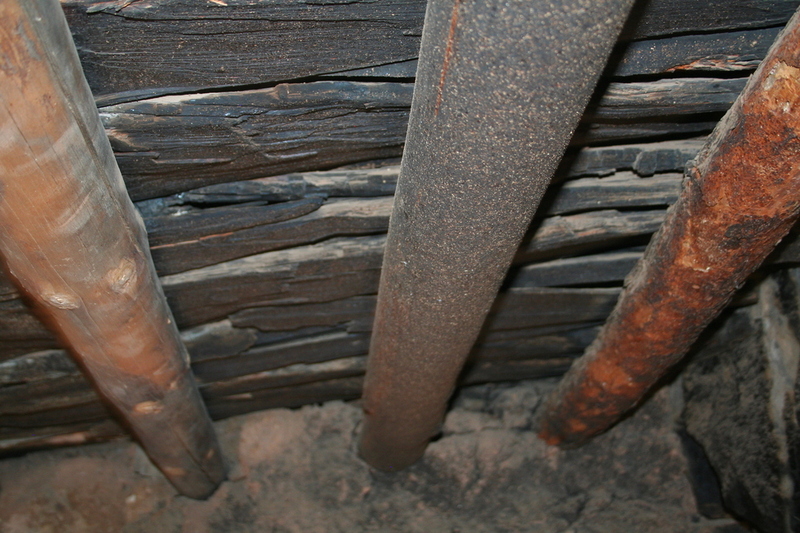 The main roof beam was severely damaged by insects and water and the structure was in danger of complete collapse. In late October of 1983, a replacement beam was dragged up the old mining road by a horse. 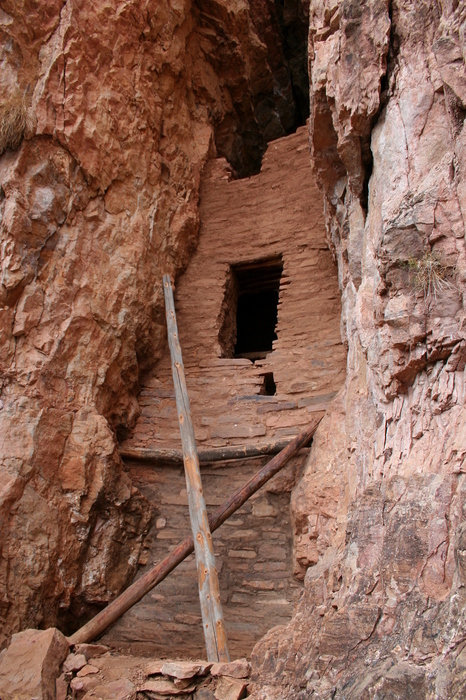 A pulley system was used to transport the beam up the scree slopes from the abandoned mining road trail to the terrace ledge near the cliff dwelling. 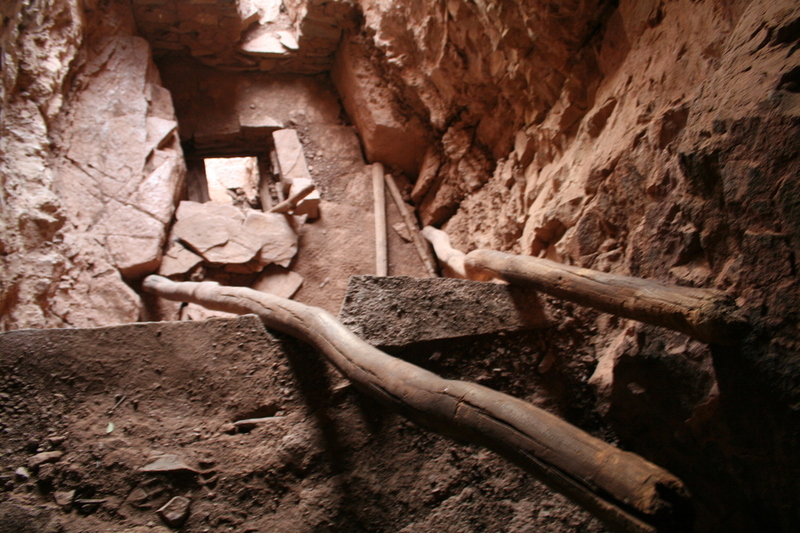 It took 4 people to accomplish the final task of lifting the beam across the terrace ledge and into position within the cliff dwelling. When one ponders the magnitude of the task in present day, you have to marvel at the determination of 700 year old civil engineering to construct these Cherry Creek cliff dwellings. 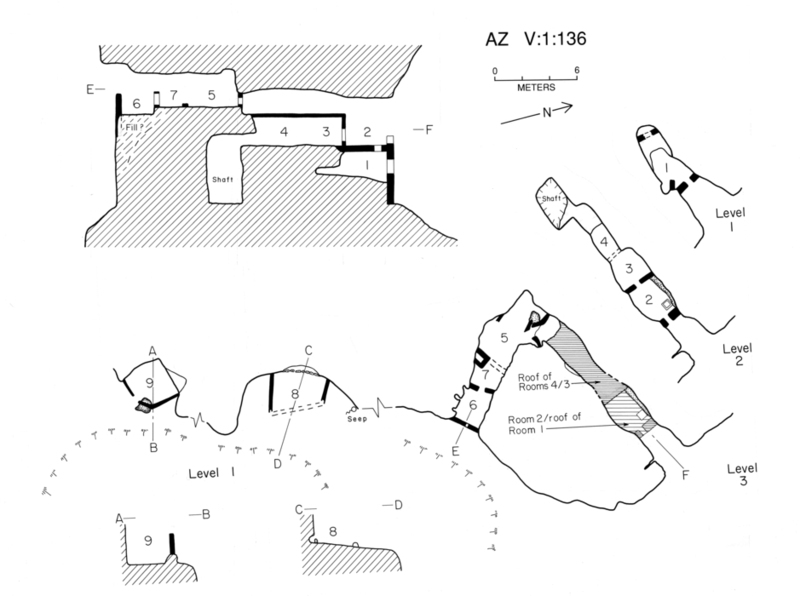 I'd like to add Cold Spring Canyon as another example of Cherry Creek cliff dwellings to the HAZ collection of hike descriptions featuring ruins. To further pique your interest, there is a distinctive mining history associated with this trail (after all, it does follow an abandoned mining road). 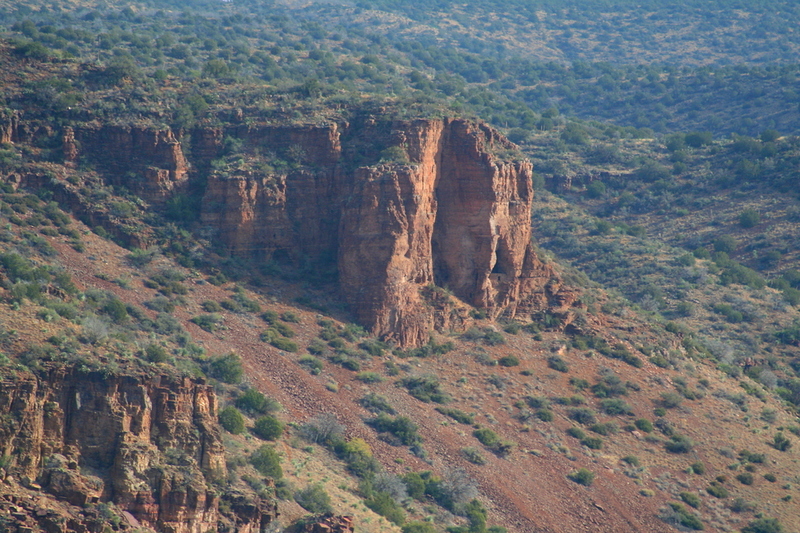 The Big Buck Uranium Mine operated from 1954 to 1957 and is located between Devil's Chasm and Cold Spring Canyon west of FR203 at the end of the abandoned mining road. Blue Rock and Grindstone prospect deposits are also located along the abandoned mining road. 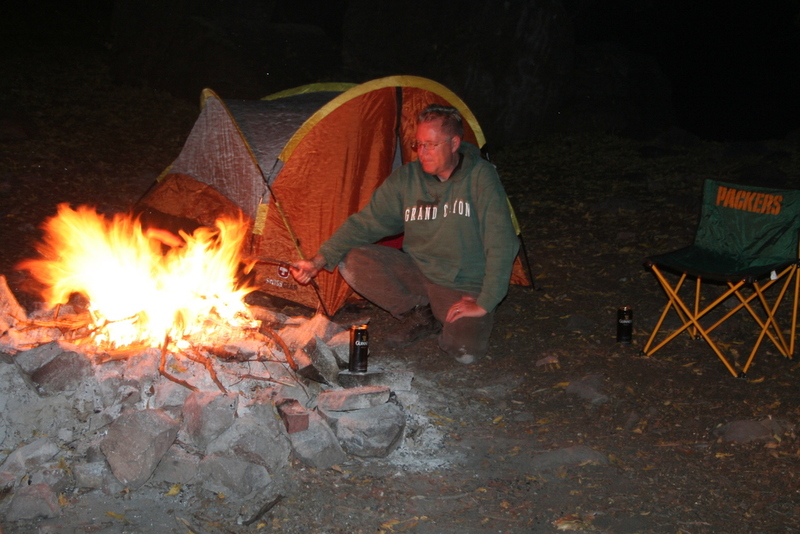 From our camp site near Devil's Chasm at FR203 continue north along the Forest Road about 1 1/4 miles until you cross Cold Spring Canyon Creek. As the Forest Road bends to the east out of Cold Spring Canyon, you will notice an abandoned mining road crossing FR203 in both directions. This is the trailhead to Cold Spring Canyon and Pueblo Canyon. Follow the steady incline of the abandoned mining road constructed in 1954 to service the Big Buck Uranium Mine. Footing can be a challenge as the old road surface is comprised of ankle-rolling "baby-heads" (~6 inch diameter rocks). 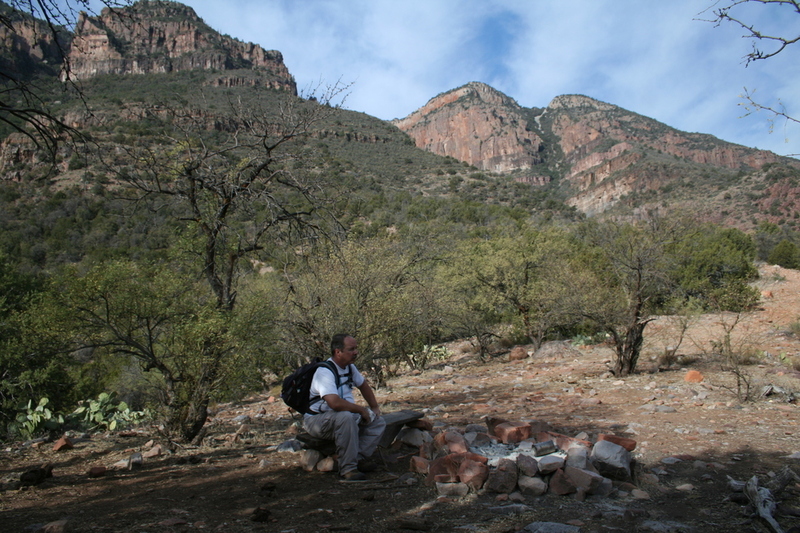 After completing the first quarter mile and rising about 500 feet, take a break at the camp site remains near the Sierra Ancha Wilderness boundary. The flat terrace near the Pueblo Canyon trail junction has a vista view of Cherry Creek valley. 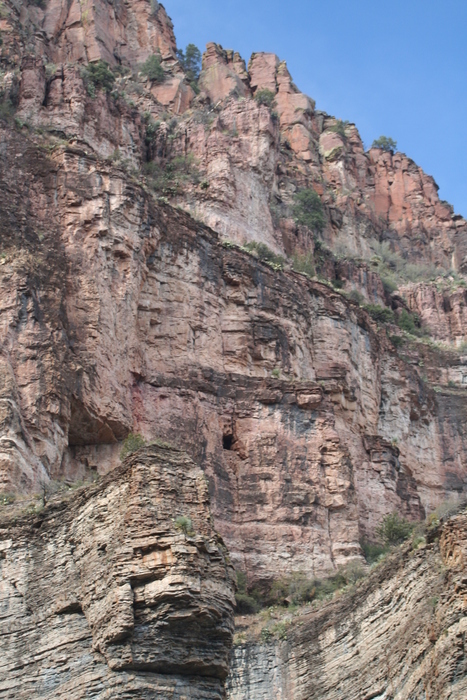 If you examine the cliff face directly to the east, you will be able to pick out the Cooper Forks cliff dwellings. At the time you make one of the first sightings of the "Crack House" there will be a scree rock slide covering the abandoned mining road. The mining road trail becomes considerably more overgrown past the scree rock slide. Note this, as you will ascend the scree upwards towards the "Crack House". This section is nothing short of NASTY. Century plants will gouge you, prickly pear needles will penetrate you, and dust will fill your lungs. 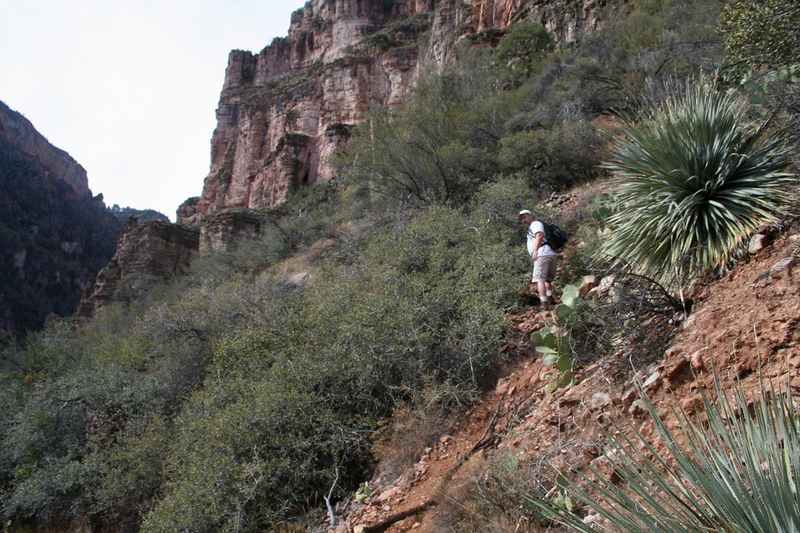 The climb is reminiscent of the scramble up to Devil's Chasm cliff dwelling. 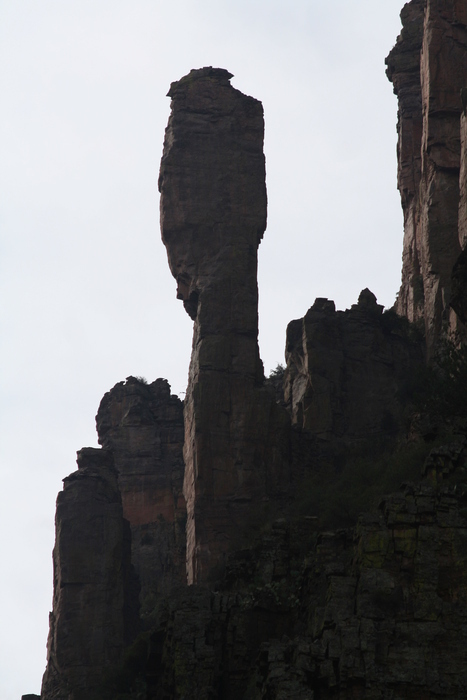 You will climb about 250 feet until you reach the cliff face. 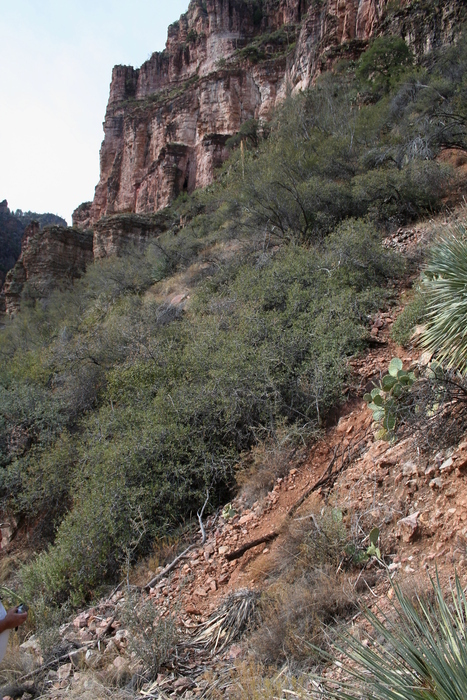 The intermittent trail will contour along the cliff face until you reach an exposed dry waterfall "punchbowl". Traverse the punchbowl heading towards a clump of trees hiding the cliff dwelling entrance. Upon passing the clump of trees, you are rewarded for your efforts! 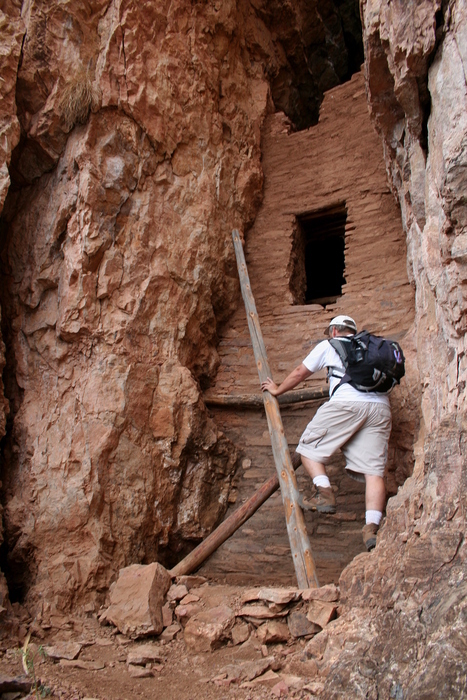 There are poles strategically located to allow entrance into the cliff dwelling. Once inside, there is much to explore. There is also a balcony view of Cold Spring Canyon. 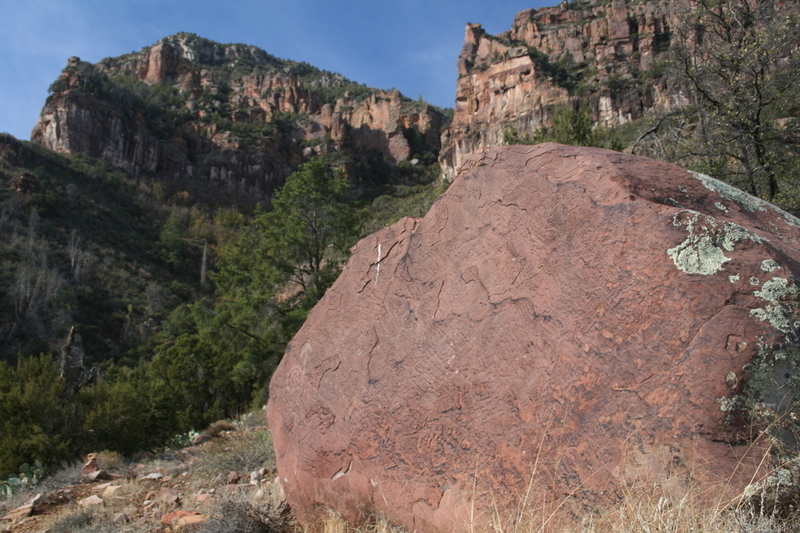 As you approach the dry waterfall crossing the north side to the south side of Cold Spring Canyon, you will notice rock cuts on the north side. 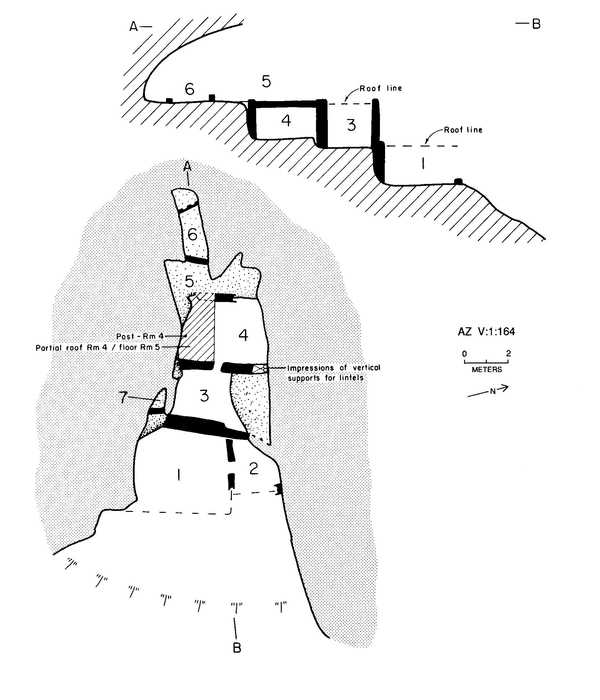 This is the Grindstone deposit prospects (see p.114 from the Sierra Ancha mining survey). Look further west up Cold Spring Canyon to view some impressive rock spires. As you travel along the south side of Cold Spring Canyon, scan the north cliff face to spot "balcony room" from site V:1:136. 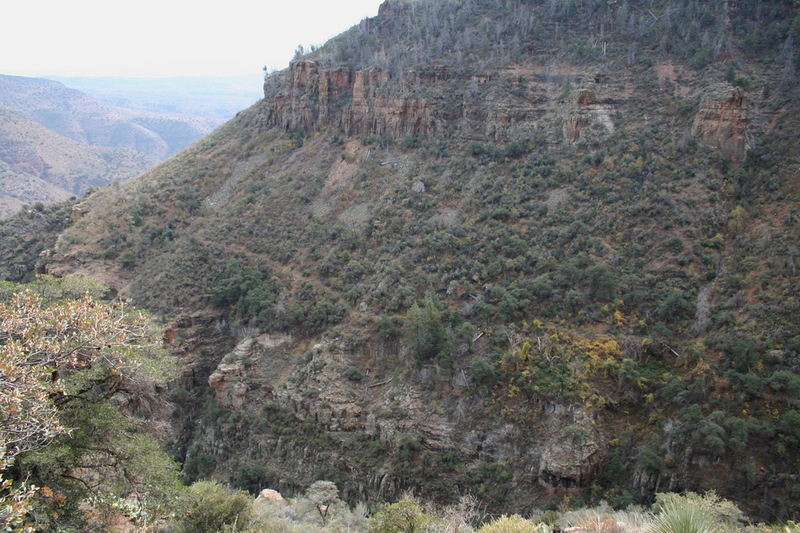 The abandoned mining road is overgrown in many sections with the occasional rock slides blocking the route. The old road will veer south traveling another half mile to reach the Big Buck Mine site (see p.94-96 from the mining survey). 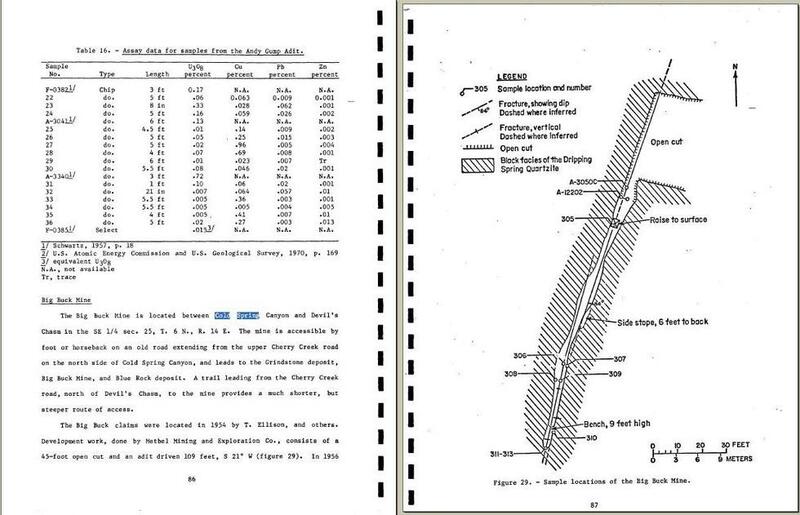 The Blue Rock deposit prospects (see p.103 from the >mining survey) are located about 2000 feet SE of Big Buck Mine. 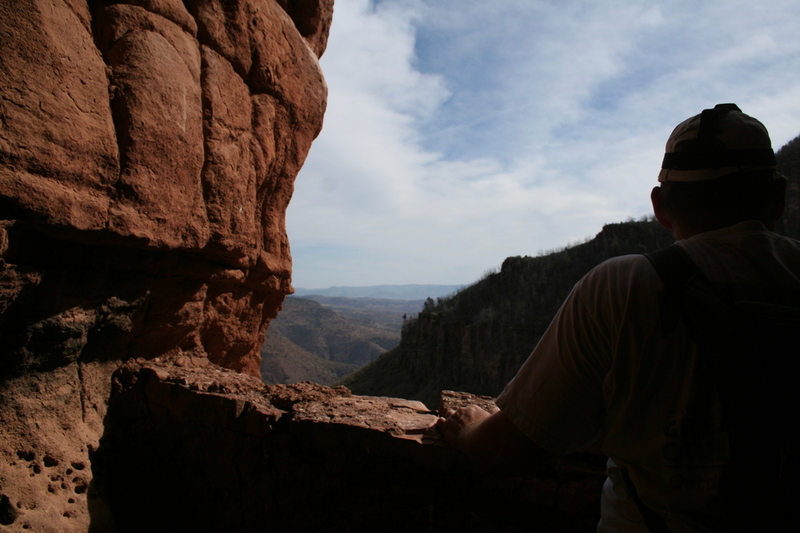 The Sierra Ancha is a special area rich in history. 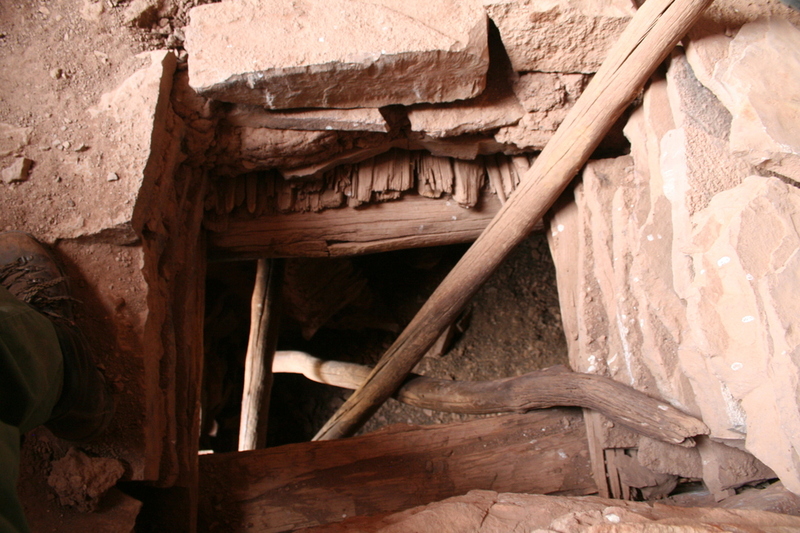 Archeological sites and evidence of past mining activity abounds. 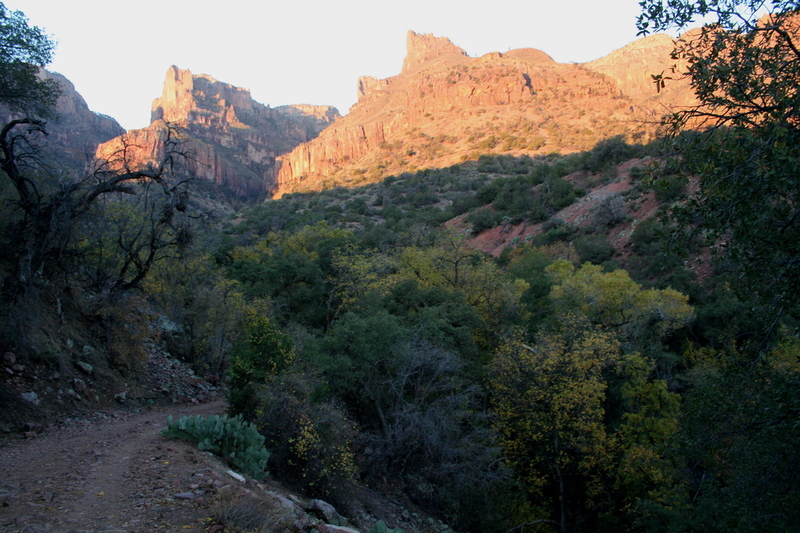 Combine this with spectacular scenery and you've got all the ingredients of a great hike. Enjoy! Directions to trail (synopsis): From Globe, take SR188 north towards Lake Roosevelt. Turn right on SR288 and follow about 2 1/2 miles past the Salt River until you reach FR203 (Cherry Creek Road). Follow FR203 for about 22 miles until you reach the trail head at an abandoned mining road located immediately after crossing Cold Spring Canyon. 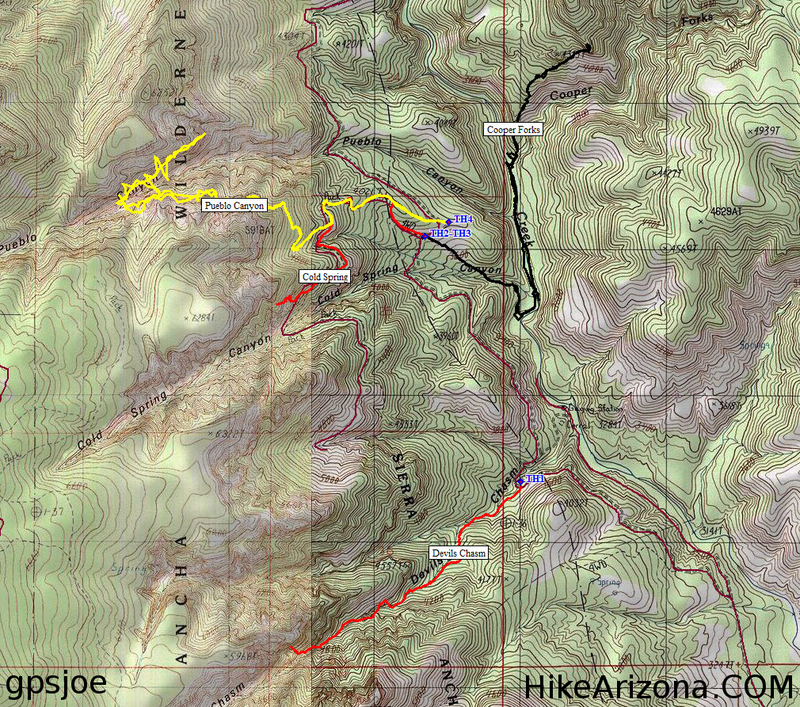 - 4th is Devil's Chasm Creek at mile 20.6 (GPS coordinates 33o 49.390'N, 110o 51.619'W). Beyond Ellison Ranch, FR203 is described as a "Primitive Road" subject to little or no maintenance. On this particular trip, there was evidence of recent road maintenance. The large boulder in the middle of FR203 between Devil's Chasm and Cold Spring Canyon has been removed and many of the washouts have been filled. My GPS noted 121.57 miles traveled from my work place in Tempe to the abandoned mining road trail head. Travel time was about 3 1/2 hours.